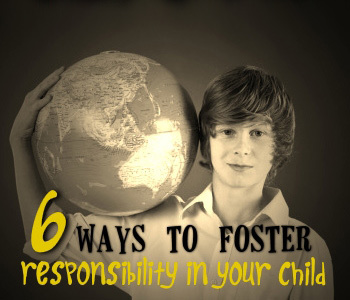 "Responsibility" is an important character trait that all children should possess. This attribute will present itself at different levels depending on the child&apos;s age, but even a child as young as two can (and should) have responsibilities. Below is a list of ways in which parents can foster this essential trait. 2. Use a hygiene checklist. Include morning tasks and "before bedtime" tasks. The chart should track showers and/or baths (including hair washing), teeth brushing, whether or not clean clothes were put on that day (especially clean underwear! ), and any other "hygiene-related" task that might be necessary to track (ears, deodorant, flossing, nail clipping, facial scrub, lotion, etc.). 3. Set behavioral goals for your child. These goals will vary considerably depending on the age of your child but such goals should at least be in place. Some ideas for behavioral goals might include "make sure your room is clean each night before going to bed," or "avoid leaving trash or personal belongings strewn about the house." Once your child has succeeded with one or two of these simple goals then add others or change the goals. You may even want to use a behavior chart or behavior contract (visit www.parentcoachplan.com for prewritten downloadable charts and contracts). 4. Allow your child to have a small pet or to practice caring for the family pet. It goes without saying that caring for a pet is a great way to practice responsibility. Children can help feed the pet, walk the pet (if it is a dog) and even clean up after the pet. Remembering to "feed the fish" is a big responsibility that children can learn to take on. 5. Teach and encourage the concept of "taking initiative." Explain to your child what it means to "take initiative" (i.e. "seeing things that need to be done and doing them without being asked") then give small rewards when your child displays that trait. The rewards need not be anything significant - sometimes a simple compliment, pat on the back, or small treat is all it takes to promote this behavior. As a simple test, you could have your child look around the house right now to try to identify three things that he/she could do to "take initiative." 6. Take a babysitting course at a local recreation center. Many rec centers offer such classes and these are perfect for young tween girls looking to take on the responsibility of caring for children in the neighborhood (it&apos;s also a great class for tweens who have younger siblings). For more parenting tips and child discipline advice please visit www.ParentCoachPlan.com.